Hussein praises family for their support during hard times. Nizaar Hussein, is probably the only father to graduate as a nurse from the Sangam Institute of Technology (SIT) College of Nursing and Health Care Education yesterday. 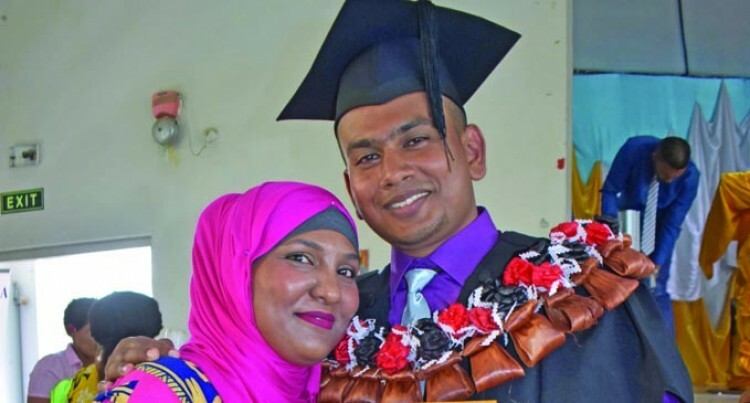 Inspired by his wife, the 30-year-old was among 92 students who graduated with honours at the Labasa Civic Centre. After completing Year 13 at Labasa College he spent eight years working for the Fiji Sugar Corporation as an apprentice. After he married his wife, who was a nurse at the Labasa Hospital, and inspired him to become a nurse so that their jobs were secured. “One day my wife, Farzana Khan advised me that the sugar industry was not stable, but one advantage of being a civil servant is that your job is always secured,” Mr Hussein of Wailevu, Labasa said. “Through her motivation and my parents’ support who were always willing to look after our kids, it encouraged me to finish my nursing education. “Life during my final year wasn’t easy for us as a family. My wife was doing her bridging course from the same school and at the same time working as a nurse on shifts. I had classes five days in a week and practical sessions were at different time of the day and night. “The secret to our success is time management and family support. We managed to juggle between studying, working and family to achieve the result today. Mrs Khan, 27, was happy to see her husband graduate. “He is the eldest of four siblings and the last in the family to graduate, but it’s not late to have a secured future,” Mrs Khan said. “As a wife I feel that every woman should support their husband and encourage them to achieve greater things.